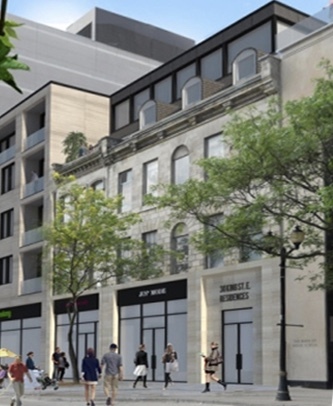 OHA+M (Ontario Heritage Act and more): Alteration, demolition — and partial demolition? Alteration, demolition — and partial demolition? As is often pointed out, retaining just a historic building’s façade keeps a small part of the structure while trashing the rest. I won’t wade into the debate about façadism. But it’s interesting to look at how we treat façade retention in our approvals process. Last time, we looked at an (alas, all-too-common) proposal for redevelopment of a row of designated heritage buildings on Hamilton’s Gore Park. Two of the buildings were to be completely demolished — and the owner submitted an application for demolition. The other two, by renowned architect William Thomas, were also to be torn down — except for one wall (the street façade) that would be retained and restored — and the owner submitted an alteration application. 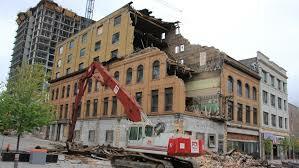 Isn’t it kind of strange that a 100 per cent demolition and a 90+ per cent demolition would be treated differently? Mostly this is owing to our bifurcated approvals process, an entrenched part, for good or ill, of Ontario’s heritage protection regime. Alteration to Part IV (individually) designated properties follows the procedures set out in section 33 of the OHA, while demolition/removal follows those in section 34. Before the 2005 amendments to the Act, as today, an application for alteration could be approved by municipal council, approved subject to terms and conditions, or refused. As for appeals… since a municipality couldn’t ultimately stop a demolition, there was no need for an appeal from a refusal. Refusal to okay an alteration, however, could be “appealed” to the Conservation Review Board, which, as the name suggests, reviews the council’s decision and makes a recommendation back to the municipality as to whether the alteration should be approved, with the council making the final decision on the alteration. Since 2005 municipalities have been able to effectively say no to demolition, but along with that power came the owner’s right to appeal (either a refusal to demolish or an approval of demolition subject to terms and conditions) to the Ontario Municipal Board. Parenthetically, there was great debate within and outside the culture ministry about whether to give this role to the OMB, which at the time had a much worse reputation in heritage circles than today. But the alternatives were the Conservation Review Board or a new body. The CRB, with its historical “review” mandate and almost exclusive focus on the worthiness of designations, seemed a poor fit, and creating a third heritage tribunal was pretty much a non-starter. With the OMB’s pivotal role in our land-use planning system, the argument went, giving the board this new function would help better integrate heritage protection into mainstream planning. It was also felt the Board would “grow into” the role as its familiarity and competency with heritage issues improved. The difference today between applications to alter and those to demolish is not so much what kind of decision really gets made in the first place but the kind of appeal you can make — on alterations, to the CRB for a recommendation and then back to council for a final decision or, on demolition, to the OMB for a binding decision. Now, faced with a choice about which appeal route they’d prefer, most applicants would opt for the OMB. But there is no choice in practice — it’s either an alteration (CRB) or a demolition (OMB), right? So, back to façadism, if a few feet of a side of a building are all that is kept, this is an alteration not a demolition. Or is it? At the outset of the hearing the OMB heard an argument that it had no jurisdiction to decide the appeal on the grounds that the revised proposal “constitutes an alteration affecting the heritage attributes of a property designated under Part IV [of the Act].” But the appeal was intertwined with the appeal of planning decisions and the city didn’t push the point. The Board nonetheless chose to address the issue and decided it had full authority to decide the appeal including (per the demolition appeal provisions of the OHA) the possible imposition of terms and conditions concerning the retention in situ of the two walls — which is what it ended up ordering. Partial demolition? Mmmn. On such a reading the decision flies in the face of the longstanding either-or, pregnant-or-not view of alteration and demolition. It would also throw a wrench into the City of Toronto’s codification of the distinction. To be clear the Board in Rams Head did not use the term partial demolition nor make any claim for jurisdiction over such situations generally. The case had come before it as a bona fide full-demolition appeal and then, as the parties attempted to reach a compromise, morphed into one about how many façades should be retained. Neither party challenged the Board’s continued jurisdiction and indeed the Board did not even need to rule on the question. When it did, all it said was that in the circumstances of the case the Board had the authority to impose the final two-façade solution. Note 1: Technically this was the case only up until 2002. Between 2002 and 2005 the owner still had to wait out the 180 days but also needed a building permit for a replacement building before the heritage building could be demolished. Note 4: The law firm Aird and Berlis takes this view: see http://www.lexology.com/library/detail.aspx?g=a39edc30-8d2b-44e5-be4a-af9e9d6522ec.